With genetically modified foods (GMOs) becoming a hotter issue, I’m getting more and more questions about the subject and not just about eating GMO foods. People are also concerned about these dangerous genes being in the fertilizers and soil amendments we use and recommend. Here are the top 10 worst GMO foods for your "do not eat" list. But as you can see, several of the worse choices are also in our gardening products. 1. Corn: Several food documentaries cover how corn is highly modified and much of it is intended for human consumption. Monsanto's GMO corn has been tied to numerous health issues, including weight gain and organ disruption. 2. Soy: Tofu, vegetarian products, soybean oil, soy flour, and numerous other products are genetically modified to resist herbicides. About 90 percent of all soy is genetically engineered to resist Monsanto's herbicide Roundup. The use of this dangerous herbicide is greatly increasing as a result. 3. Sugar: Genetically modified sugar beets have been altered by Monsanto to resist herbicides. Sugar beets are a common sugar source in the US and other countries. 4. Aspartame: This is a toxic additive used in numerous food products and should be avoided for several reasons such as it's being made with genetically modified bacteria. 5. 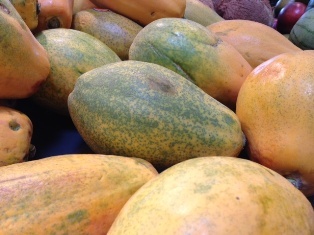 Papaya: GMO papayas have been grown in Hawaii since 1999. Though they can't be sold to countries in the European Union, they are accepted in the U.S. and Canada. 6. Canola: This is one of the most chemically altered foods in the U.S. diet. Canola oil comes from rapeseed through a series of chemical actions. 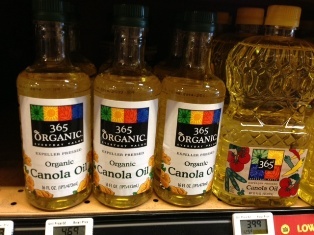 Even the “organic” version of this product is bad fat compared to olive oil, coconut oil and butter. The so called “health” grocery stores like Whole Foods, Central Market and Natural Grocers should stop using and selling this product. 8. Dairy: Dairy products have several issues. Many contain growth hormones such as Monsanto's health-hazardous rBGH. It has been banned in 27 countries, but is still in most US cows. Some of the “organic products” are even contaminated. For your health, demand raw milk and cheese. 9. Squash: Squash, zucchini and other related crops have been modified to artificially resist viruses and other diseases. 10. Wheat: This grain has been altered and made less healthy in a dramatic fashion over the years. The GMO addition is the latest assault. Some of the dangers of some of these foods are well-known - for example, Bt toxin in GMO corn has been detected in the blood of pregnant women and their babies. But perhaps more important are the risks that are still unknown. There’s no way to be certain what risks these lab-created foods have hidden and are waiting for us. The best advice is to steer clear of them altogether – but that is almost impossible. If they are in the soil, how can we neutralize them? For now, all I can suggest is continuing the natural organic program and doing everything you can to stimulate life – the biological activity in the soil. Healthy microbe activity helps with various other contaminations in the soil, such as pesticides, salt fertilizers, heavy metals etc., so hopefully they will take care of the GMO contamination as well.